Save work on converting Oracle data to Access. The OracleToAccess application was designed to be a data conversion tool that helps DBA and database programmer convert Oracle data to Access. - Wizard - step by step. - Easy visually config, just click on the mouse. - Displaying Progress, time estimation. 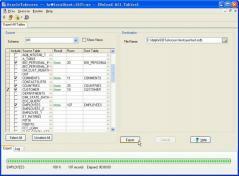 - Saving and loading session parameters, let you repeat your task easily. - Preview and seeing results immediately. - Convert from both table and query.